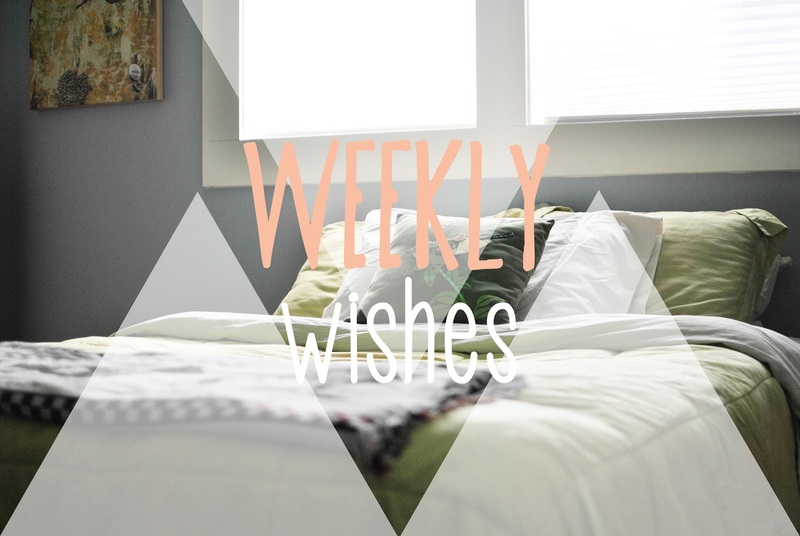 Weekly Wishes make Mondays awesome. Be sure to head over to see Melyssa at The Nectar Collective as well, where this all started! - Go to bed at a decent hour. I could have definitely done better with this! I did (already) procrastinate my homework one evening because I was spending time with family, so I had to stay up until 1:45am finishing it. That's not so great when you have to get up at 6:30am. But the rest of the week went pretty well! - Practice filming things. It just so happened that an opportunity for my friend and I to film a lady to promote her florist business came up, so last week we hung out at her studio and filmed her prepping flowers for a wedding. It was my first time filming anything, and I did make a mistake in the lighting (some of the clips were too dark), BUT the content and flow and composition were great, so that is good! It is much easier to fix those problems than to teach someone to have "the eye." We also got to go with her to the wedding site a couple days later and film her setting up and the ambiance of the flowers! So, check! - Enjoy my new job! I start a new job this afternoon and I am pretty excited about it! It will be nice to start working again regularly, and getting to know some new kids. - Finish buying all of my books and school supplies. Guys, books are expensive. I knew that they were expensive all along, but I have been able to find ways to keep the cost down, like buying used ones online. That doesn't make much of a difference this semester, so that has been kind of a bummer and a struggle. - Stay on top of homework. Focus and get it done early! Makes everything so much easier and gives me more time to relax and do things I love. Love your blog, especially having your page tabs on the side! I totally agree that books for school or in my case uni are so expensive! I managed to get mine from EBay. And most popular is downloading a rented copy on my laptop. That way I can find my key words and relevant paragraphs! Good luck this week! I'm definitely going to check out Chelsea's post - I need all the help I can get with budgeting! Have fun with the new job this week and best of luck with the wishes! Good luck with your goals this week. My goal is to also stay on top of my homework, mostly when it comes to reading.